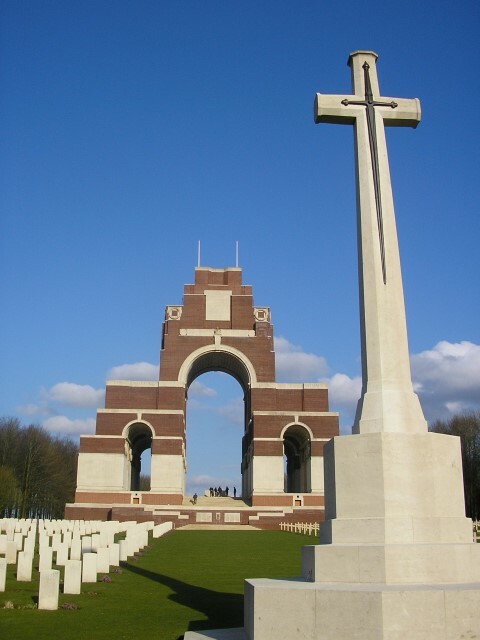 32166 Private Thomas A. Alderson, 10th Battalion, the Durham Light Infantry was killed in action 16 September 1916 and is commemorated on the Thiepval Memorial to the Missing of the Somme. He was about 21 years old and is commemorated on the Etherley War Memorial and the Roll of Honour in St. Cuthbert’s Church, Etherley. Private T.A. 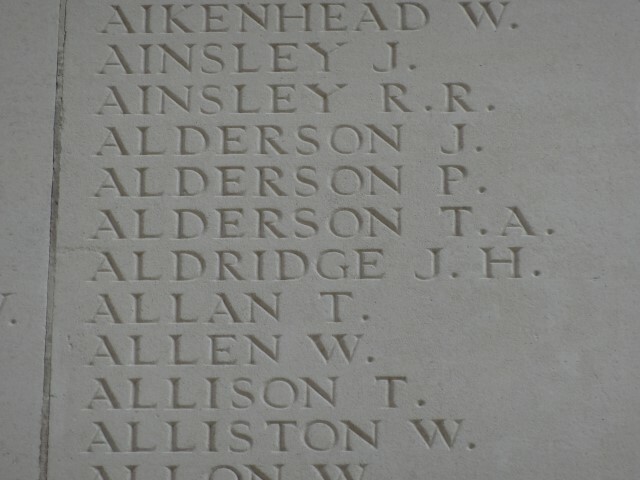 Alderson was posted to 10/DLI 4 September 1916 in time for the upcoming Battle of Flers-Courcelette. 15 September 1916: The Battle of Flers-Courcelette commenced. The XV Corps were made up of the New Zealand Division, the 41st and 14th Divisions and were under the command of Lieutenant General Henry Horne. They were at the centre of the attack and were responsible for the capture of Flers. 10/DLI was part of the 43rd Brigade of the 14th Division. The 6th Somerset Light Infantry, 6th Duke of Cornwall’s Light Infantry and the 6th King’s Own Yorkshire Light Infantry joined the 10/DLI in the 43rd Brigade. The 43rd Brigade took up position between Delville Wood and the village of Ginchy. The 41st Division was to their left and the Guards to their right. The attack was no local affair, it was a big effort. It was the last chance to win the war in 1916. The attack was preceded by a 3 day bombardment of some 828,000 shells – twice the concentration of that delivered on the opening day of the Battle of the Somme. To assist, 18 tanks of D Company, Heavy Section Machine Gun Corps were commissioned although only 14 managed to get to their starting points. The tanks would be used in small groups along the front with the aim of moving ahead of the infantry to suppress German strong points. However, a creeping artillery barrage was not to be employed on these identified strong points. Thus, if the tanks failed then the infantry would be left to its own devices. The infantry was still the primary force on the battlefield. The attack on Flers was successful but the men of the 41st Division suffered severe losses in the course of the long day – 15 September. Alongside them, the 14th Division faced what looked like a dangerous manoeuvre of straightening out a “pocket” of German resistance pressing into the British lines to the east of Delville Wood. A preliminary operation was ordered for 0515 but in the event, the Germans abandoned their position without much of a fight. When the main advance came, the Division encountered much stiffer resistance before it was able to successfully conform to the general advance made by the XV Corps. 15 September: 10/DLI moved forward from Bernafay Wood via Pommiers Redoubt then advanced during the afternoon through Delville Wood to the trenches east of the Longueval-Flers road. At midnight the battalion went forward to the front line facing Gueudecourt and attacked the Gird Lines at 9.25 am (16 September.) The leading waves were soon checked by strong machine gun fire. Renewed attacks followed at 6.55 pm before withdrawing to Bulls Road. The battalion was relieved 17 September and billeted at Pommiers Redoubt. On the Division’s front, the creeping barrage was weak and inaccurate. On the right, 6/Somerset came under fire from Gas Alley and made little progress. West of the Ginchy-Gueudecourt road, the 10/DLI came under severe fire from front and right flank and took cover in shell holes. The 6/KOYLI and 6/Duke of Cornwall’s attempted to reinforce but suffered the same fate. An order to renew the attack at 6.55pm was carried out with no success. 15 September:, afternoon, the battalion occupied trenches east of the Longueval-Flers Road, German shelling, 8 men killed. 16 September: dawn, considerable enemy movement near Gueudecourt village beyond Gird and Gird Support trenches. 9.25am: orders received to attack with the objective to break through the Gird defences, clear Gueudecourt and establish a line beyond. A heavy British bombardment opened up. 10/DLI went forward at the appointed hour. 17 September: dawn, the 21st Division were coming up as relief and the 10th handed over positions before dawn. A very weak battalion reached Pommiers Redoubt during the morning 17 September. Losses in killed, wounded and missing amounted to 381. Later research confirms that 3 officers and 136 men of the 10/DLI were killed in action 16 September 1916  including Private T.A. Alderson. Private T.A. Alderson had been in the Army for 251 days. He had landed in France on the 25 August and was posted to the 10/DLI “A” Company 4 September and was killed in action 16 September 1916 having been in France for only 22 days. Private T.A. Alderson was awarded the British War and Victory medals. The Battle of Flers-Courcelette raged on for another week and was regarded as a major success particularly when compared with the results of August and early September. A considerable stretch of the German front line had been captured and their second line system had been breached in the Flers sector. High Wood and the Bazentin Ridge had been captured and opened up an improved tactical position for the British – enhanced observation positions over the German lines. The Germans made a tactical retreat to the Le Transloy Ridge. But, the British casualties were atrocious and were comparable in percentage terms to the debacle of July. It was estimated that the Fourth Army suffered over 29,000 casualties. All 3 Divisions involved in the central push – the New Zealand, the 41st and the 14th all suffered severe casualties in achieving their objectives but significantly, there were no fresh reserve divisions behind them to surge forward and leapfrog onto victory. Furthermore, the new weapon, the tanks had shot their bolt. In the analysis of the overall performance of the tanks, the general consensus is of disappointment, if not failure. The officers and crew had not enough time to be trained properly. The infantry had no time to train with them. The tanks were plagued with mechanical failure. They were too slow and noisy. The visibility from the tanks was poor. At this stage of development, common sense rather than specialist military knowledge counted for more in their analysis – their virtues were exaggerated, they needed to be more powerful and the noise needed to be reduced!